Elon Musk has long dreamed of building a colony on Mars. 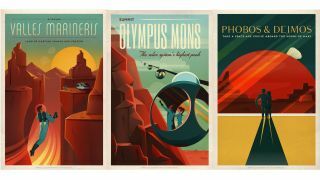 The tech required to make the red planet habitable to humans may not be much closer to reality, but these retro travel posters are making us wish it was. Discover Valles Marineris, one suggests, where you can set up your carapod and gaze across the valleys with your dog. Alternatively, you can take "a space-age cruise aboard the moons of Mars" or scale Olympus Mons, "the solar system's highest peak".